I am using TexWorks and I need to put all help files produced by Latex into a subfolder relative to the folder where I have my master .tex file. On these StackExchange pages there are answers to this question, but only for people using a command line for latexing their .tex files. But I am using TexWorks, and do nok know how I can add such commands there. My question is, can I put some command code into the "Arguments" window for pdflatex ? The two pictures below shows the location of the "Arguments" window. 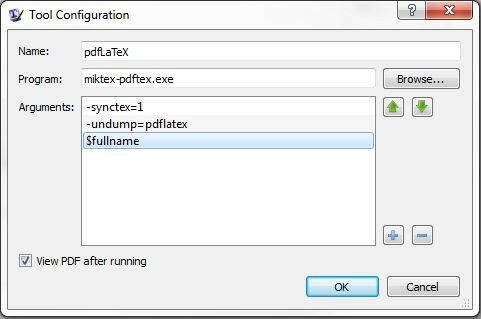 To get the "Tool Configuration" window in Texworks: in the Processing tools window, press "pdflatex"
In the below screenshot you can see how I configured Texworks to put aux files into the directory "test". The command to add is -aux-directory=.\test or any other directory. You have to create the directory manually, I think. Not the answer you're looking for? Browse other questions tagged auxiliary-files texworks output or ask your own question.